North Attleboro, MASS- After losing a tough battle against Foxboro last Wednesday, the Eagles got rocked by the North Attleboro Rocketeers by a final score of 14-2. From the opening faceoff, North Attleboro seized control of the game. Less than 30 seconds in, North put one past Sharon goalie Jonathan Greenberg. The physical superiority of North was evident in this first quarter, as they quickly forced turnovers by pressing out on the Eagles offenders. “It was very tough to get any good looks against these guys,” junior Brady Buckman said. In the second quarter, not much changed for Sharon. In total, they had less than five shots in the first half resulting in a half time score of 11-0. “It’s frustrating to not be able to produce any offense, but we had to keep going out there and try to claw our way back,” sophomore Brandon Buckman said. With the game out of hand, the Rocketeers showed why they are a top team in the Hockomock division as they showed no remorse for Sharon. Their defense only got stronger and while their offense possessed the ball for minutes at a time. 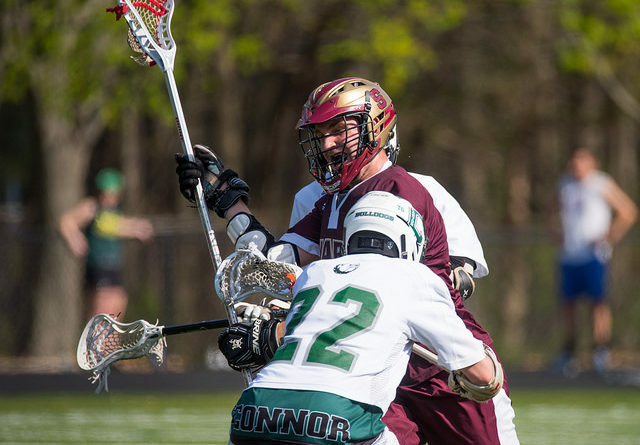 Finally, late in the third quarter, junior Brett Litner beat the North goalie stick side low. “It was just relieving to see [Brett] put one in the net,” senior Jack Lesser said. “You never want to be shut out. It’s a gross feeling,” Lesser added. Litner scored another in the fourth quarter, but in the end Sharon fell by a final score of 14-2. Next up Sharon plays Stoughton at home on Wednesday in a rebound game for the 2-7 Eagles. On a separate note, the team is hosting a fundraiser at Chipotle in Norwood tonight from 4-8 PM. 50% of the proceeds will go towards team funds.